When you stop to think about it we have been playing games in one form or another almost since time began. The meaning and application of games has changed dramatically over the years and although the concept of ‘game’ is not new, the term of ‘gamification’ is. Perhaps one of the first forms of gamification could be noted as a toy introduced through the infamous Cracker Jack box way back in 1912. Nothing really happened over the next 68 years, up until 1980. It was then that Richard Bartle co-created MUD1. This ‘game’ was a pioneer effort to introduce the first known massively multiplayer online game. This was the first time that people could experience a collaboration platform that was interactive (even though not interactive by today’s standards). It was MUD1 and others like it introduced way back when pc’s were more in the dinosaur age of evolution as compared to what they are today that helped to shape what gamification is and will be in the future. It wasn’t until 2002 that another element of gamification came into play and that was in the form of ‘serious games’. Serious Games can best be summed up in stating that it’s a game, but one that is used for training/learning purposes through simulation, etc. It was this movement and the term coined as ‘Games for Change’ that began lying a path down for the real introduction of gamification. In 2007, Bunchball introduced the first ‘modern’ gamification platform. Since then a whole host of other companies have launched competing products revolving around a gamification-like platform and other systems. In the past decade the gaming industry has transformed into a profitable empire, especially due to the wide use of the internet as a gaming platform serving a wide variety of devices. Gamification has become an industry buzz word over the last few years since its original introduction of the term back in 2010 by Nick Pelling. Perhaps Tadhg Kelly (http://techcrunch.com/2012/12/08/real-vs-fake-gamification-mechanics/) described it best when he wrote an article for TechCrunch stating the following: “Gamification mechanics should be simple to understand. All they are the actions that players take (“agency”) and the rules that limit those actions to create pressure (“urgency”). Between those two poles lie an interplay that is described as a “loop” (“I hit ball, see if ball stays inside the court and if opponent returns ball, I hit ball again”), and a whole bunch of loops produces a “dynamic” (we trade the ball many times until one of us makes a mistake and loses a point).” He also went on to state “While the essential idea of gamification is “just add game mechanics…” So when you think about it, Gamification is not new. Rather it is something that has existed for some time, but just was named and re-invented. 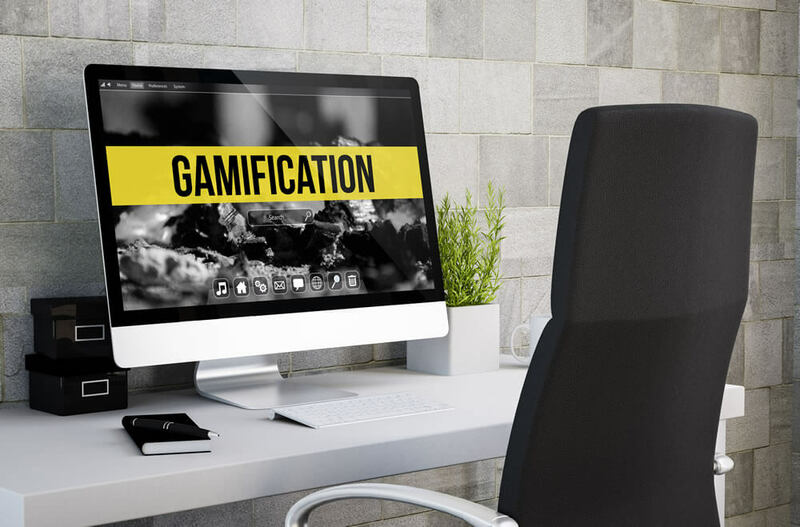 With the rise of the ‘virtual world’ hype a few years back a lot of the below elements that gamification encompasses came into play as well as extending into a variety of other applications. These gaming elements may appear subtly or overtly in a course. In order to correctly apply these gamification elements you must first fully understand the learner/ trainee motivation. Once this is fully understood then incorporate the right components of gamification into the application. The future is bright for this topic and its wide array of applications. From healthcare to the financial market, government, training and education and the list goes on (and on). Let’s not forget that gamification also takes on other forms such as customer loyalty programs, advertising and business-related gaming. If the below studies are any indication of the widely accepted use of video games, then gamification is bound to gain rapid success in the near future. Gamification has the potential for real-world changed if used in the right settings with the correct elements. It has the ability to actually produce change in daily habits, which in itself is a very powerful task. The participatory experience that leads to the behavior change is a feat in and of itself. Some naysayers may think that gamification is ahead of the curve, I think it is here to stay and possesses endless possibilities on its applications. Nevertheless as gamification evolves the process that it evokes may change too. Try to imagine your life gamified… the video below is a little over the top demonstration of a ‘gamified life’ but nevertheless it does make you stop and think- what life would be like if it was gamified?